These days, US Bank is retreating on multiple fronts. First and most immediately, protesters at UC Davis recently won an important victory in the battle against the financialization of public education when the bank decided, following a blockade that lasted an entire quarter, to close its on-campus branch. While it remains unclear whether the new ID cards that UC Davis students were forced to obtain, which double as US Bank ATM cards, will be phased out ("Your Aggie Card. Your ATM Card. All in one. "), the bottom line is that a central and high-traffic space on campus has been stripped from the bankers' hands. The administration and the Regents will continue their search for "new, fun sources [of revenue]," as UCD Associate Vice Chancellor Emily Galindo described the US Bank deal (at approximately minute 2:30 in the linked video), but this space is ours -- it belongs to the students, workers, faculty, and community -- and we won't let them sell it off (or, for that matter, sell us off) again in backroom deals to their fellow 1%-ers. All of this is taking place in a context of increasingly apocalyptic discussions about the possibility that the student debt bubble is about to burst ("This could very well be the next debt bomb for the U.S. economy"). We don't want to get into that debate here. All we want to do is offer some brief thoughts on the possible intersection of the parallel retreats of US Bank/corp we identified above. The imbrication, that is, between two levels of scale: the blockade and subsequent decision of US Bank to abandon its Memorial Union branch; and the strikingly coincident decision of US Bancorp to abandon its financial position in the student debt market. This is why shutting down the bank of campus is not just a sensible idea but an obvious first step in reclaiming education. The bank is not only profiting, but it is also the emissary of the profit motive; it does nothing else. Perhaps the closing of this small branch is purely symbolic; it won’t end global capitalism, after all. But perhaps it’s something more. Everybody starts small. You fight where you can. The fact that there are ten thousand banks doesn’t mean you don’t begin with one -- it means you do. Closing a single recruiting center wasn’t going to end the military, but one by one, such closings helped end the war. The bank is fighting a war on your future, and for the moment the university is collaborating -- on the wrong side. 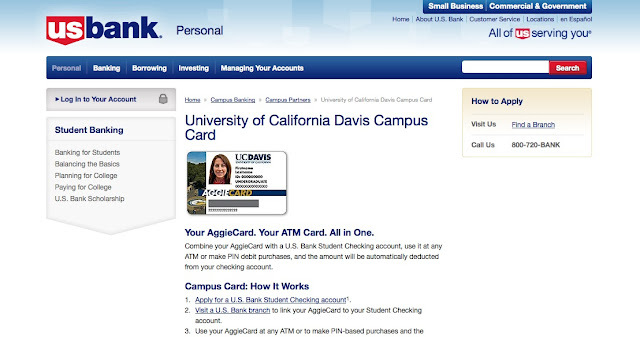 While there's no question that the bank blockade directly caused US Bank to withdraw from the campus of UC Davis, it would be absurd to suggest that the same blockade was responsible for scaring US Bancorp into deciding that student debt was no longer worth it. It's not just a question of scale. For the bank's financial managers, student debt simply wasn't generating enough profit to justify the expense. And with defaults rising, those same profits may appear increasingly risky in their speculative eyes. In other words, US Bancorp's withdrawal from the student debt market was a result of the crisis. That crisis, however, takes many forms: it is a crisis of profitability, of course, but it also appears as precarity in its multiple economic and affective senses; as austerity and the regime of state violence on which it depends; and as the global waves of outrage, protest, and insurrection that more than anything characterize our historical moment. It is out of this last formation of crisis that the slogan emerged during the California student movement in the fall of 2009: we are the crisis. If the bank in Memorial Union is "the emissary of the profit motive," as Clover suggested, then it also constitutes a localized, concrete form into which this abstract phenomenon had congealed. We should understand the blockade, likewise, as a small but significant drop in a much larger wave that not only forced US Bank off campus but also pushed US Bancorp out of student debt. uhhh, you clearly know nothing about student loans. the worst loans are private loans, i.e. loans that come from what you call "a legitimate and well established institution like a national bank." they have higher interest rates and less protections than public loans from the federal government. In other words, banks are shady student loan mills.